Introduction: Strategies on different levels in organic synthesis. 2. Experimental study of reaction conditions. Initial remarks. 3. Models as tools. 4. General outline for screening experiments. 5. Two-level factorial designs. 6. Two-level fractional factorial design. 7. Other designs for screening experiments. 8. Summary of screening experiments. 9. Introduction to optimization. 10. Steepest ascent. 11. Simplex methods. 12. Response surface methods. 13. Summary of strategies to explore the experimental space. 14. The reaction space. 15. Principal properties. 16. Strategies for the selection of test systems. 17. Quantitative relations between observed responses and experimental variations. 18. A method for determining a suitable order of introducing reagents in one-pot procedures. 19. Concluding remarks. Appendices. Index. 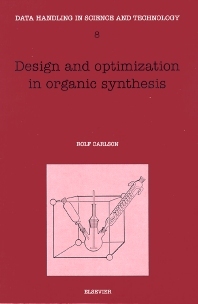 This is the first general textbook on experimental design and optimization in organic synthesis. The book presents a unified methodology for carrying out systematic studies when the objective is to develop efficient and optimum synthetic methods. Strategies are included both for exploring the experimental conditions and for systematic studies of entire reaction systems (substrates, reagent(s) and solvents). The methodology is based on multivariate statistical techniques. The following topics are treated in depth: classical two-level designs for screening experiments, gradient methods (steepest ascent, simplex methods) as well as response surface techniques for optimization, principal components analysis and PLS modelling. The book is intended as a hands-on text for chemists and engineers engaged in developing synthetic methods in industrial research, e.g. in fine chemicals and pharmaceuticals production, as well as for advanced undergraduate students, graduate students, and researchers in an academic environment.